7 Kids and Us: A Toy Rental Company??? WHAT?? How Cool! 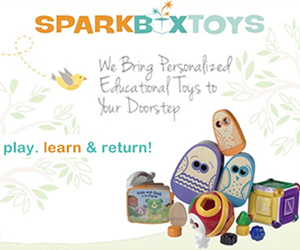 Spark Box Toys is a toy rental service that brings personalized learning toys to kids under 4. Get the world’s best toys at a fraction of the cost! For children 6 months to 4 years old, get a box of 4 toys every 8 weeks and send them back when you are done. Say good bye to toy clutter and say hello to educational fun! · Play: Get a box of 4 unique educational toys selected from toy makers around the world. · Learn. Expertly selected to suit your child’s developmental needs. · Return. When you are done, send the box back and receive another! Always free shipping! Safe & Clean! All toys are sanitized, inspected and repackaged using organic products. Spark Box Toys is sustainable, philanthropic and eco-friendly. Best part is ... all of the toys will find their final home in the neediest schools around the country.